1 Now athe Lord said to Abram, "Go forth from your country, And from your relatives And from your father's house, To the land which I will show you; 2 And aI will make you a great nation, And bI will bless you, And make your name great; And so cyou shall be a blessing; 3 And aI will bless those who bless you, And the one who curses you I will curse. bAnd in you all the families of the earth will be blessed." 4 So Abram went forth as the Lord had spoken to him; and aLot went with him. Now Abram was seventy-five years old when he departed from Haran. 5 Abram took Sarai his wife and Lot his nephew, and all their apossessions which they had accumulated, and bthe persons which they had acquired in Haran, and they set out for the land of Canaan; cthus they came to the land of Canaan. 6 Abram passed through the land as far as the site of aShechem, to the oak of Moreh. Now the Canaanite was then in the land. 7 The Lord aappeared to Abram and said, "bTo your descendants I will give this land." So he built can altar there to the Lord who had appeared to him. 8 Then he proceeded from there to the mountain on the east of Bethel, and pitched his tent, with aBethel on the west and Ai on the east; and there he built an altar to the Lord and bcalled upon the name of the Lord. 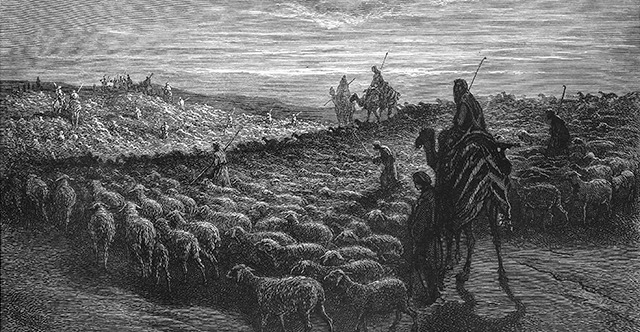 9 Abram journeyed on, continuing toward athe Negev. 10 Now there was aa famine in the land; so Abram went down to Egypt to sojourn there, for the famine was bsevere in the land. 11 It came about when he came near to Egypt, that he said to Sarai his wife, "See now, I know that you are a abeautiful woman; 12 aand when the Egyptians see you, they will say, 'This is his wife'; and they will kill me, but they will let you live. 13 "Please say that you are amy sister so that it may go well with me because of you, and that bI may live on account of you." 14 It came about when Abram came into Egypt, the Egyptians saw that the woman was very beautiful. 15 Pharaoh's officials saw her and praised her to Pharaoh; and athe woman was taken into Pharaoh's house. 16 Therefore ahe treated Abram well for her sake; and bgave him sheep and oxen and donkeys and male and female servants and female donkeys and camels. 17 But the Lord astruck Pharaoh and his house with great plagues because of Sarai, Abram's wife. 18 Then Pharaoh called Abram and said, "aWhat is this you have done to me? Why did you not tell me that she was your wife? 19 "Why did you say, 'She is my sister,' so that I took her for my wife? Now then, here is your wife, take her and go." 20 Pharaoh commanded his men concerning him; and they escorted him away, with his wife and all that belonged to him.